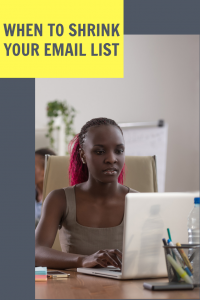 So you’ve built an email list. Congratulations! Building an audience is one of the most important pieces of getting your message out to the world. Unfortunately, you may have noticed that your hard-earned subscribers aren’t exactly engaging. When this happens, it might be time to cull your list. What does it mean to “cull” your list? Specifically, we’re talking about the act of removing people from your email list, but this concept can be applied to anything. It can mean shutting down a social media channel, unfollowing a ton of people, closing down your Facebook group, or even switching up who you serve. If this sounds counter-intuitive, stick with us. It can be hard to let go of audience members you’ve worked for, but doing so can actually help your business. As your business shifts and grows, odds are your audience will also shift and grow. We’re constantly evolving as business owners, and as a result you may outgrow your original audience. We’ve been there ourselves. When we first started to build our list, we served entrepreneurs who were new to business. They were still figuring out their voice, still figuring out their services, and still looking for their first clients. That’s changed. These days, we serve leaders who have established businesses. They’ve been around the block more than once and are looking to spread their message to more people. Some of our early audience members have stuck around and fit our current audience. Others don’t. And those people are less likely to open our emails, engage with our content, or buy our services. We’re cluttering up their inboxes and they’re impacting our stats. What do you do when your audience has changed? With so many other moving pieces to your business, you don’t have time to make sure every subscriber feels engaged. At least, you don’t have time to do so manually. Luckily, most email platforms allow you to create automation sequences. This is an amazing tool for keeping your subscriber list engaged. An automated engagement sequence is essentially a series of emails that are triggered to send when someone has not opened an email from you in a certain amount of time (say, three months). When the sequence is triggered, an email is sent offering a freebie. If that email isn’t opened then they get a few more follow-ups before they are automatically removed from the list. Boom. Your sequence runs in the background and your list is automatically being trimmed of dead weight. Sometimes the automated sequence isn’t enough. If you have a feeling your audience isn’t engaging or is engaging but not converting, it may be time for a manual list cull. This is where you give your entire list an option: Stay in or Opt out. Before a recent list cull, we sent several emails that were designed to help people decide whether our list was the right place for them. In the end, we sent three or four emails along these lines. They were the first step in a list culling process that allowed us to embrace a list filled with the right people. At the end of a week or so we cut everyone who chose not to engage with our emails. This is a more aggressive list culling technique that’s worth doing anytime you feel like your automated sequence isn’t doing the trick. As we move forward, we’re focusing on growing our list with the right people, rather than relying on vanity metrics (the number of subscribers you have is meaningless if they aren’t opening your emails). Cultivate deeper, more personalized relationships. 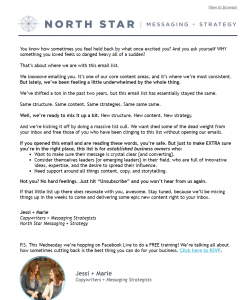 Create more guided email content, based on real, in-the-moment needs. Continue to nurture your relationships as you scale. Can you create meaningful relationships with a larger list? Of course. Segmentation and automation (and amazing relationship-driven content platforms like MemberVault) allow you to maintain engaged audiences even when they’re large. But a small list with solid performance will always beat a huge list with no performance. When you build a firm foundation of engagement, a deep understanding of your audience, and a responsiveness to their needs, it makes it easier when you’re ready to scale. No one wants to feel kicked out, excluded, or left behind. That said, it’s important to maintain the opportunity of choice within your community. Transparency is one of the most effective messaging techniques, and this is true for shrinking your audience as well as growing it. Make sure you are sharing openly and freely and give your audience every opportunity to be a part of your list. It should be no surprise to them when you stop showing up in their inbox (and if they choose to resubscribe, make it easy for them to do so!). 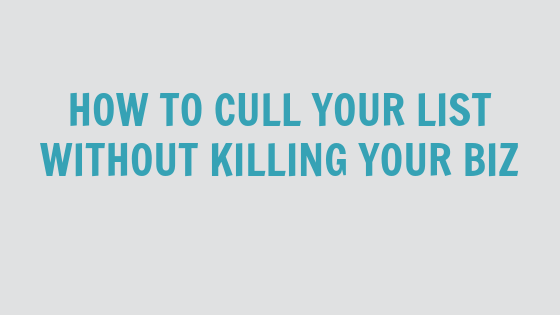 And that’s all for Episode 23: How to Cull Your List Without Killing Your Biz. Thank you so much for joining us (live or via the replay). We’d love to know what you do when your audience starts feeling unengaged. Leave a comment and let us know. Did you get value from this post? Pin it so others can, too!